Did Christ Say What He Meant, and Mean What He Said? 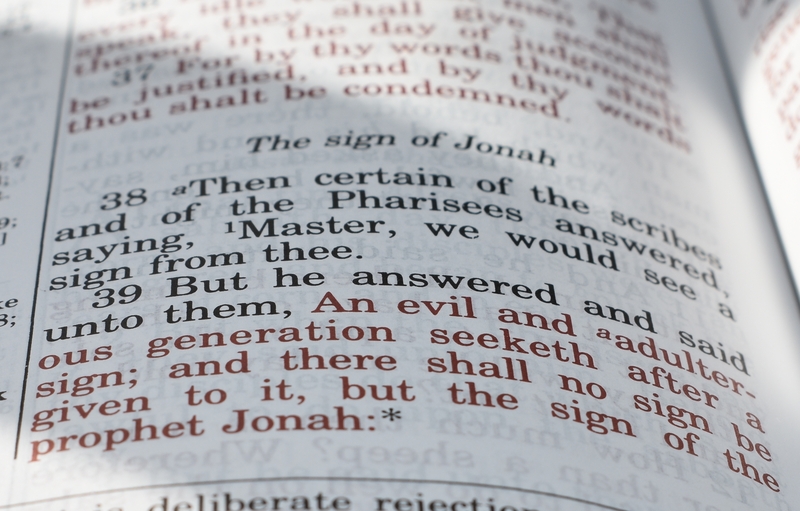 “Teacher, we want to see a sign from You.” But He answered and said to them “An evil and adulterous generation seeks after a sign, and no sign will be given to it except the sign of the prophet Jonah. For as Jonah was three days and three nights in the belly of the great fish, so will the Son of Man be three days and three nights in the heart of the earth” (Matthew 12:38-40 NKJV). Do “three days and three nights” occur between sunset ‘Good Friday’ and sunrise Easter Sunday? Did Christ mean what He said: “three days” and “three nights”? Even as with Jonah and the great fish—so will the Son of Man be “three days and three nights in the heart of the earth” (Jon. 1:17, Mat. 12:40). Most professing Christians commonly accept the tradition that Jesus was crucified on Friday, and then resurrected at sunrise on Easter Sunday morning. Yet few have ever thought to question or to prove this “Good-Friday-Easter” tradition. Yet the Bible tells us to prove (to test) all things (1 Thess. 5:21). For proof there is but one dependable authority, the historical record, the Bible. Of course, this includes Christ’s words. He said “Heaven and earth shall pass away: but my words shall not pass away” (Mat. 24:35, Mar. 13:31, Luke 21:33). Can we get three days and three nights from Friday evening to Sunday morning? What could the scholars be thinking when they say 36 hours, a day and a half, equals “three days and three nights”? Consider the tremendous import—the overwhelming significance—of Jesus’ statement. He expressly declared that the only sign He would give to prove He was the Messiah was that He would be three days and three nights in “the heart of the earth” (the sepulcher). The unbelieving Pharisees demanded a sign; Jesus offered but one. That divine sign, is not the resurrection itself. It was the length of time He would repose in His grave, before being resurrected! Think what this means! Jesus staked His claim to being your Savior and mine upon remaining exactly three days and three nights in the tomb! If He would remain just three days and three nights inside the earth He would prove Himself the Savior. However, if He failed in this sign, then He must be rejected as a fraud, an imposter, a liar (John 14:6; 8:45; 8:44, 1&hairsp;Thes. 2:13)! Let us not forget that it is Satan, the adversary, that is the liar, and has deceived the whole world (John 8:44, 2 Cor. 2:11; 4:4, Rev. 12:9). Is it any wonder a false religious belief system would set up a tradition that, in fact, denies that Jesus is the Messiah?! “Beware lest any man spoil you through philosophy and vain deceit, after the tradition of men, after the rudiments of the world, and not after Christ” (Col. 2:8). This singular divine sign given by Jesus for His Messiahship has greatly bothered many commentators and Theologians. Some attempts to explain away this sole proof for Christ’s divinity (Deity) are ridiculous. Yet they must attempt to explain away Christ’s words, or their “Good-Friday-Easter” tradition collapses; and they would have to admit their tradition is wrong. Yet even if that were true, it still would not fit their tradition. They claim that Jesus was placed in the tomb shortly before sunset Friday, and rose at sunrise Sunday: two nights and one day. The Bible’s definition of the duration of “nights and days” is simple. Even critical scholars admit that in the Hebrew language, in which the book of Jonah was written, the expression “three days and three nights” means a period of 72 hours—a triad of twelve-hour days and a triad of twelve-hour nights. “And Jonah was in the belly of the fish three days and three nights” (Jonah 1:17). They admit this is a 72 hour span. Jesus said AS Jonah was three days and three nights in the fish’s belly, He would be three days and three nights in His grave. As Jonah was in the “grave” 72 hours [after which he was supernaturally resurrected by God and the fish vomited out Jonah upon the dry land (Jonah 2:2, 10) to become a savior to the people of Nineveh by proclaiming the warning to them], equally would Jesus be 72 hours in His grave, and then be resurrected by the Father to become the Savior for all of humankind. Jesus said “Are there not twelve hours in a day? . . .” (John 11:9). Obviously Jesus knew how much time was in a day. Many texts tells us that Jesus rose the third day. How does the Bible define the time required to fulfill “the third day”? God “divided the light from darkness. And God called the light Day, and the darkness he called Night. And the evening (darkness) and the morning (light) were the first day . . . And the evening and the morning were the second day . . . And the evening and the morning were the third day” (Gen. 1:4-13). Here we have the Bible’s definition explaining and counting the amount of time involved in the expression “the third day.” It includes three dark periods called “night,” and three light periods called “day”—to fulfill exactly three days and three nights. And Jesus said they contain twelve hours for each period—which means this required a span of 72 hours to fulfill the third day. That ought to be conclusive! Most children would readily understand this simple truth (Mat. 11:25, Luke 10:21). Why Denial of Such Plain Truth? What is wrong with these plain, simple words of Jesus? How do all these scholars and theologians know Jesus was crucified “Good Friday” and rose “Easter Sunday”? The simple answer is, they do not know it—for it is not true! It is merely an errant tradition commonly taught and casually assumed to be true! Jesus warns against “making the word of God of none effect through your tradition” (Mark 7:13). We have examined two scriptural passages, in Jonah and in Matthew, both setting the duration of the body of Jesus in the tomb as three days and three nights (which the Scriptures plainly define as 72 hours of time). Now let’s examine four other scriptural witnesses that prove the same thing. “And he began to teach them, that the Son of man must suffer many things, and be rejected of the elders, and of the chief priests, and scribes, and be killed, and after three days rise again” (Mark 8:31). Most children can figure this. If Jesus had been killed on Friday, and then after one day He had risen, the resurrection would have then occurred on Saturday evening. If after two days, it would have occurred Sunday evening. If after three days, it would have occurred Monday evening! Examine this thoughtfully. One cannot, by any sound math process, calculate any less than a full 72 hours (three days and three nights) in a resurrection which occurred three days after the crucifixion. If Jesus was in the grave only from Friday sunset to Sunday sunrise, then this text too, must be torn out of the Bible—or else Jesus Christ must be rejected as an impostor! If He rose after three days, it might have been more than 72 hours, but it could not have been a second less. ” . . . They shall kill him; and after that he is killed, he shall rise the third day” (Mark 9:31). The duration expressed here would be between 48 and 72 hours. It could not be one second past 72 hours, and Jesus still rise the third day. Nor could it be Friday sunset to Sunday sunrise, because that is only 36 hours (to the middle of the second day after He was killed). “After three days I will rise again” (Mat. 27:63. Again, this cannot possibly be calculated as less than 72 full hours. “Jesus answered and said unto them, Destroy this temple, and in three days I will raise it up . . . But he spake of the temple of his body” (John 2:19-21). To be raised up in three days after being destroyed, or crucified and buried, could not be more than 72 hours. So, if we are to accept all the testimony of the Bible, we must conclude that Jesus was exactly three days and three nights—three full 24-hour days—72 hours in the grave—or else the only supernatural proof that He promised must fail! Now notice carefully this fact: In order to be three days and three nights—exactly 72 hours—in the tomb, our Lord had to be resurrected at exactly the same time of day that His body was buried in the tomb. If we can find the time of day of the burial, then we have found the time of day of the resurrection. If the burial, for instance, were at sunrise, then for the body to be left an even three days and three nights in the tomb, the resurrection likewise had to occur at sunrise, three days later. If the burial were at noon, the resurrection was at noon. If the burial were at sunset, the resurrection was at sunset, three days later. The crucifixion day was called “the preparation,” or day before “the sabbath” (Mat. 27:62; Mark 15:42; Luke 23:54). This day ended at sunset, according to Bible reckoning (Lev. 23:32). Jesus cried out soon after “the ninth hour” or three o’clock in the afternoon (Mat. 27:46-50; Mark 15:34-37; Luke 23:44-46). Yet Jesus was buried before this same day ended—before sunset (Mat. 27:57; Luke 23:52-54; John 19:42). John adds, “There laid they Jesus therefore because of the Jews’ preparation day.” According to the laws observed by the Jews all dead bodies must be buried before the beginning of a Sabbath or feast day. Hence Jesus was buried before sunset on the same day He died. He died shortly after 3 p.m. but was buried before sundown. Notice carefully—the burial of Christ’s body was in the late afternoon! . . . Between 3 p.m. and sunset as these scriptures prove. And since the resurrection had to occur at the same time of day, three days later, the resurrection of Christ occurred, not at sunrise, but in the late afternoon, near sunset. Startling as this fact may be, it is the plain Bible truth! If Jesus rose at any other time of day, He could not have been three days and three nights in His grave. If He rose at any other time of day, He failed to prove, by the only sign He gave that He was the true Messiah, the Son of the living Creator. Either He rose at the end of a day near sunset, or else He is not the Christ! He staked His claim on that one and only sign. Now we come to an objection many have raised; and yet this is the very point which actually proves this truth! The Word of God says the day after the crucifixion was a Sabbath. For centuries, people have assumed the crucifixion was on Friday. We have seen by each of the four Gospels that the crucifixion day was called “the preparation.” The preparation day is the day before a Sabbath—a day to prepare for the Sabbath. But for what Sabbath? John’s Gospel gives the answer: ”It was the preparation of the Passover.” “For that sabbath day was an high day” (John 19:14, 31). What is a “high day”? It is one of God’s Annual Holydays, one of His Feast Days or His Annual High Sabbaths. God’s people observe seven Annual Sabbaths every year. Annual Sabbaths fall on certain annual calendar dates, and on different days of the week in different years, similar to Roman holidays now observed. This first Annual Sabbath might fall on Tuesday, Thursday, or on the Sabbath, depending on the yearly cycle. Matthew 26:2 states “Ye know that after two days is the feast of the passover, and the Son of man is betrayed to be crucified.” Following through this chapter shows that Jesus was betrayed and crucified on the Passover. Exodus 12 records the account of the original Passover. The children of Israel killed the lambs, and struck the blood over the doorposts and on the side posts of their houses. Wherever the blood had thus been applied the death angel passed over that house, sparing it from death. Following the Passover is a Holy Convocation, an Annual Sabbath. ”And in the fourteenth day of the first month is the Passover of the Lord. And in the fifteenth day of this month is the Feast” (Num. 28:16-17). The Passover lamb, killed every year on the fourteenth day of the first month called “Aviv,” was a type of Christ, the Lamb of God that taketh away the sin of the world. Christ is our Passover, sacrificed for us (I Cor. 5:7). Jesus was betrayed and killed on the very day of the Passover. He was crucified on the fourteenth of Aviv, the first Hebrew month of the year. The Passover, is the day before—and the preparation for—the Feast day, or Annual High Sabbath, which occurrs on the fifteenth of Aviv. This Sabbath occurs on different days of the week. Frequently it occurs and is observed on Thursday. This High-Day Sabbath will occur again on Thursday in 2020 and 2023. The Hebrew calendar shows that the year Jesus was crucified, the fourteenth day of Aviv, Passover, was the middle of the week, what we call Wednesday. Since Biblical days begin at sundown, this Passover day began at sundown Tuesday night. The High Sabbath occurred on Thursday. Biblical days begin at sundown, so this Sabbath day began at sundown Wednesday night. This was the Sabbath that drew on as Joseph of Arimathea hastened to bury Jesus’ body late Wednesday afternoon! The first to visit the tomb, Mary Magdalene and the women, came to the sepulcher on the first day of the week (Sunday) very early, while it was yet dark, as the sun was beginning to rise, at dawn (Mark 16:2; Luke 24:1; John 20: 1). Here are verses that many take to mean the resurrection was at sunrise Sunday morning. Yet, what do these verses say? At that time Sunday morning while it was yet dark, Jesus was not there! Notice how the angel says, “He is not here, but is risen” (see Mark 16:6; Luke 24:6; Mat. 28:5-6). When the women arrived, the tomb was already open! Jesus was already risen at sunset Sunday morning! Of course! He rose from the grave in the late afternoon, near sunset! And since we know Christ was buried late Wednesday afternoon, and that the resurrection took place at the same time of day three days later, we now know the resurrection of Christ occurred late Saturday afternoon, sometime before sunset. The weekly Sabbath ends at sunset. The resurrection was late on that day, before the beginning of the first day of the week. It was not, then, a Sunday resurrection at all. It was a Sabbath resurrection! So far we’ve examined the claims of Christ before His crucifixion, and associated texts that show that His only promised sign was that of being three days and three nights in the grave. And we’ve seen Biblical affirmation in the resurrection account that He did rise at the same time of day that He was buried. Yet “scholars” maintain that Jesus was wrong—that He was only in the tomb two nights and one day. Is there further Scriptural affirmation that He did spend the exact amount of time in the grave He said He would? The angel of the Lord gave this testimony: “He is not here: for he is risen, as he said” (Mat. 28:6). He certainly did not rise as He said unless He rose at the precise time that He had said. We have the word of the angel of the Lord, recorded in the sacred Word of God, that Jesus did fulfill His sign. He was three days and three nights in the earth—He did rise late on the weekly Sabbath afternoon, not on Sunday morning. The third day following His Wednesday burial was the weekly Sabbath. The resurrection, after three full days in the sepulcher, was not Sunday morning, but Saturday afternoon, just prior to sunset. Jesus was crucified on Wednesday, the middle day of the week. He died shortly after 3 p.m. that afternoon; was buried before sunset Wednesday evening. Now count the three days and three nights. His body was Wednesday, Thursday and Friday nights in the grave—three nights. It also was there through the daylight part of Thursday, Friday and Saturday—three days. He rose Saturday the Sabbath—late afternoon, shortly before sunset, at the same time of day that He was buried! This prophecy has the application of a day for a year, so that this 70th week became a literal seven years, with Christ being “cut off” after three-and-a-half years’ ministry, as He was. Yet it is perhaps equally significant that He was also “cut off” on the middle day of a literal week. Mark 16:9 says “Now when Jesus was risen early the first day of the week, he appeared first to Mary Magdalene, out of whom he had cast seven devils.” Here is a scripture that many interpret to say the resurrection was on Sunday morning. But the expression “was risen” is translated in the perfect tense. From the Greek Aorist Active Nominative, the King James translators purposely translated it “was risen.” What was Jesus’ condition early the first day of the week? Was He “then rising” or did He “then rise” from the grave? At the time He appeared to Mary Magdalene, He was risen. Of course. He had risen the late afternoon before, so He indeed “was risen” on Sunday morning. Though this text can cause misunderstandings, it actually affirms the other Scriptural statements that have been given. Another passage that might confuse is Luke 24:21: “… And beside all this, today is the third day since these things were done.” These disciples were fully aware that the women and Apostles had found the tomb empty (Luke 24:22-24). The Greek indicates “All these things,” whatever they had conversed about. Almost certainly this would include setting the seal and watch over the tomb of Jesus (Mat. 27:62-66), which was not completed until Thursday. This verse says Sunday was the third day since (all) these things were done. Sunday truly is the third day since Thursday. But Sunday is not the third day since Friday, so this text could not prove a Friday crucifixion. And yet there is one more final proof of this truth. A vital text proving that there were two Sabbaths in that week has been obscured by many English translations. Yet in the original Greek, the language these scriptures were written in, the word “Sabbath” is in the plural—Sabbaths. Fenton renders it correctly by saying, “After the Sabbaths.” In a footnote to this text, he states: “The Greek original is in the plural, ‘Sabbaths. '” Fenton’s version and a few others do get this point correct. There is only one sound explanation for this. After the Annual High Sabbath, the first Feast Day of the Days of Unleavened Bread—which was Thursday—these women purchased and prepared their spices (on Friday, which was also the preparation day for the Weekly Sabbath—and was also the day after the High Sabbath referenced in John 19:31). A comparison of these two texts proves there were two Sabbaths that week, with a day in between. And not only is it “Sabbaths” in Mat. 28:1; but there are several scriptural witnesses of this same truth! However, in Mark 16:2, 9 the text is literally “the first (day after) the Sabbaths“! In fact, in Luke 24:1 and John 20:1, 19, it is also literally “the first (day after) the Sabbaths“! And again, in Mat. 28:1, “first day of the week” is literally “the first (day after) the Sabbaths“! In the Greek—this refers to multiple Sabbaths—or it can refer to multiple first days (plural) after multiple Sabbaths. Yet here in these texts it can only mean one thing; there were multiple Sabbaths that week which preceded that first day! Most assuredly, Christ did fulfil His word and His sign (Rev. 1:5). He died on the very day of the Passover, and was placed in the “heart of the earth,” (the sepulcher) just before sundown of the First High Day of Unleavened Bread (John 19:31, 38-42). That year the First High Sabbath of Unleavened Bread began on what we call Wednesday night. Christ was placed in the sepulcher just before sundown Wednesday night. He reposed for three days and three nights in the heart of the earth and was resurrected just before sundown—exactly three days and three nights later—near the end of the weekly Sabbath day!